Remembering the Martyr's who laid their lives on 9/11 fighting the Islamic Tyranny in USA . IS THE FREE WORLD SAFE? Now its almost seven years, since Allah’s followers attacked America and maimed thousands of American’s . Its one of the gruesome terror plot ever executed anywhere on face of the Earth. That day (9/11, 2001) , I will never be able to forget and no freedom loving person should ever forgive the Crime committed on Innocent civilians . The gruesome visuals which were broadcasted on Indian TV channels is still fresh in my memory . Where ever I’am on this day, I rise to pay my condolences to all the victims of Islamic -Terror , who lost their lives in different parts of the world . May lord give strength to us all to fight the Islamic Tyranny, and Bless us to be Victorious. Day before 9/11, 2001 , I came to Hyderabad (India) from my home town to meet my cousin-Sister . That night we both chatted till late in the night . I slept very late. I could hear someone yelling my name. I was in deep sleep , and felt that sound came from too far away . I could not recognize my cousin-sisters voice in sleep. Sensing no response from me, she came to my bed and shook me violently, in turn I woke up only to see a ‘terrified’ expression on my cousins face . She , with a choked voice told me that plane has crashed into World Trade Centre. I told my Sister to calm down and I tried to pacify her saying it must be a foggy day and plane crash could be an accident. And I went to brush my teeth , with in no time she came running saying that another plane crashed into WTC. I was bit irritated thinking that she might have seen the Replay of the same visual in different angles. I wish it was true , but I was shocked to see TV visuals , I coud not believe myself that anything of this nature of Terrorist Attack can ever happen on American soil. For next 30 min’s or so , Me , my Sister and my Brother-in-Law were dumb stuck. More news started rolling on , that another plane crashed into Pentagon and news came of few failed attempts elsewhere in USA . President Geoge W Bush came on Televison to address the Nation and said it is WAR on America and Pronounced Emergency in the country . Then , that part of time we could understand the seriousness of the attack. The whole day Me and My cousin went through a great pain. We don’t even remember that we were so pre-occupied with the Attack thoughts that we missed our morning cup of Tea and Breakfast. I did not moved a Minute from my seat , my heart grieved to hear that thousands of civilians were killed during the WTC attack. More I saw of burning Pentagon, Collapse of Twin Tower and more I grieved. The fire balls of Pentagon, the Dust & Smoke at Twin Towers were more like a scene from an Hollywood film. But this was too real and one is forced to believe it . 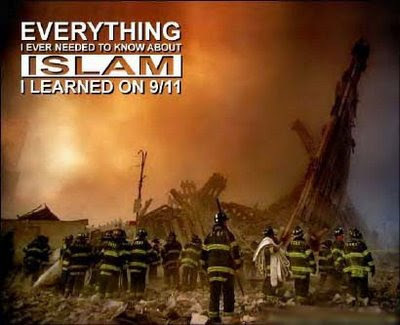 After Seven years, every time I remember WTC attack , I keep saying Myself Never Forget - Never Forgive these Islamic Jihadis . Annihilate them before they find some more Innocent Victims. Lemme assure Americans that you guyz are not alone on waging WAR-on-Terror , We are with you, the whole of Free-World is with you. I declare on behalf of Billion -Hindu’s that we are with you and and I pass on my deepest Condolences to family members who were killed by Islamic Terrorist on 9/11. And vehemently pray to Lord to grant a place for those souls at his ABODE. Some things leave foot print permanently on ones mind .First Day at College, First Salary , True Love , First Kiss …. like wise one is also forced to remember some tragic incidents in ones life like , Loss of closed ones , Betrayal in Love and so on ….. Some are worthy of being remembered and remaining are forced upon to remember . I remember this day as, that which have cemented my Will to fight against Islamic Terrorism .